Place the nuts in a food processor or blender. Blend lightly so it remains crunchy. Add water as needed, to make is more creamy and or thin. Add water slowly. 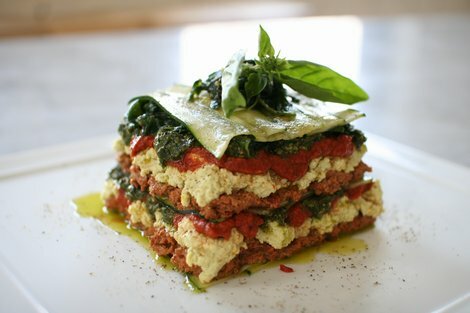 In a glass dish, layer the ingredients in the following order: spinach leaves, red marinara sauce, and then the white nut cheese. Follow this with another layer.